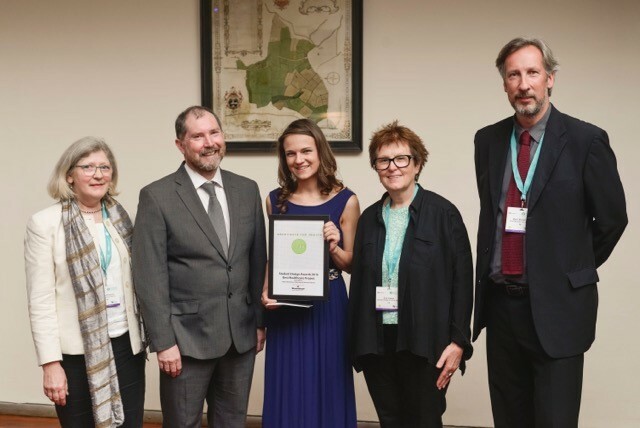 Congratulations to Polina Andreeva, Chelsea College of Arts MA Interior & Spatial Design student who received one of two student awards at the prestigious Architects for Health Annual Award Ceremony, held recently at the Royal College of Physicians. Polina is part of Chelsea’s Hospital Placemaking group, funded by The Enterprise Collective. Polina Andreeva’s research engages the spatial aspects of child development and she has designed an innovative outside play area for the Evelina London Children’s Hospital, at St. Thomas’ Hospital. Inspired by the Science Museum, this multi-sensory environment combines physical discovery (the effects of colour or gravity) with some basic scientific principles around visual and tactile perception. This sense of play is also captured by the spirit of her constructivist inspired drawings.